Since you're so strict on the no touching clause, I'll see if I can widen the construction a little sometime later. Well done Tychi, nice work! Do you think 16 is possible? sophisticated engineering that represents an upper limit. 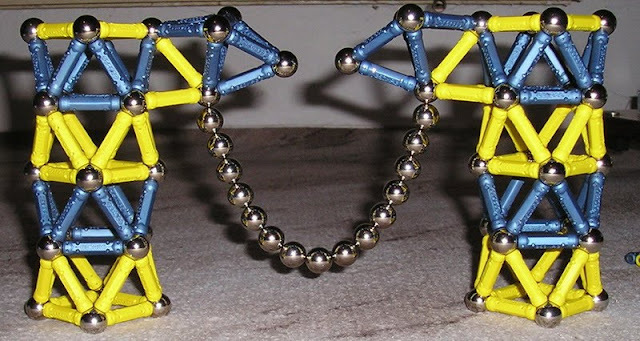 It's well-known that the maximum number of rods that can be in contact with a ball is 14.
attached to a single ball are not stable. karl, I also tested "power" 7, but more than 15 suspended balls did not hold. As with most Geomag creations (especially if you don't have a clear idea of what you're aiming for), this started off as...well, nothing really! The same is true for the Lobster and the StellaFinder3000 (a luminous beer bottle holder, useful in some circumstances anyway!) - some other Geomag creations of mine. You may have guessed by now that the naming ceremony is almost as important as the creation with me. Last edited by El Mundo on Wed Nov 25, 2009 9:32 pm, edited 1 time in total. Really nice all of you. I thought I had the dark horse idea that would beat them all, but after a brief building session it was back to the lab for me..
And.. Knowing the nature of the Internet, I'm convinced that the sentence between the two photos in El mundo's last post will pop up unintentionally in many a Google search.. By the love of all that is magnetic, it's called "HANGING SPHERES"
hmmm, I must give this a shot after my exams are over. So was the final rod count allowed 96, or 144? It was 144, but it is achievable in much less.